I don't know about you, but when I am feeling stressed, something gives physically. I get a sniffly nose, my back aches, my shoulders tense up - my body just doesn't feel 100%. 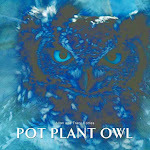 Perhaps that's how Pot Plant Owl feels with her unhatched egg - 'Shelly'. Ive watched her over the past few days. When I see her, she rolls her egg between her legs, and just stares down at it for the longest time. Maybe she's willing it to open. Maybe she's asking what may have happened. Maybe she's just staring at an egg. PPO hasn't been 100% today and although the owl expert could see nothing visibly wrong, she advised us to watch PPO closely. That, we can do. And the only thing we can do to help PPO with any 'stress' or 'confusion' she may be feeling, is to remove Shelly - the unhatched egg. So that is what I did, and good thing I did it now. The egg STINKS already and if it had broken in the pot, I think we'd all have had to abandon ship (house) and flee. Pot Plant Owl flew to the balcony railing, and I crouched under the umbrella for a few minutes talking to her. She was on edge, alarmed, and ready to attack. But here's the funny thing. As soon as my hand slipped between our sleeping beauties (the two chicks) and lifted the egg up, Pot Plant Owl seemed to visibly relax a little. By the time I had backed up to the door, PPO's feathers were unruffled and she was looking towards her pole. I think it may soon be a case of "Out of sight, out of mind". I was watching, (from many thousand miles away) and caught a pic of the umbrella :-) and am glad you took shelly away. Poor PPO must have been wondering what to do with the egg. I also saw the umbrella as it slipped away, and am much relieved. I had been thinking about the potential for breakage of the egg, and resultant smell and mess; thought it might cause abandonment of the nest and therefore the chicks. I won't have internet access after today for over a week, and am grateful this was resolved before I go. Thank you SO MUCH for your updates-- I've gone back and read all the old ones to become oriented on the layout of the balcony, nest and so forth. Wow! Thank goodness it hadn't opened in the "nest"! I'm sure PPO was thinking how she can get rid of it without ruining her nest. Now she can comfortably love and care for her chicks without the distraction of what she must have known not to be viable. Thank you Tracy and Allen for allowing people from literally all over the world to come together to watch nature in a way we would never be able to! It is an honor and blessing to be able to do so. Great news! So glad to hear of PPO's positive and calm reaction to that stubborn eggie and it's eventual removal. wondering if you examined the egg for any cracks, candled to see how far along the chick was if it all or if the wildlife people will be doing a post egg exam for any info. Thanks T&A, you do a great job and i really enjoy your site. I'm so glad you were able to remove the egg. Rest in peace, little Shelly. I was concerned yesterday because PPO seemed to be gone so much from the nest. I hope she's more at peace now. Thank you so much for sharing this owl family with all of us! Thank you for your kind and considered interactions with PPO and family. I am relieved that she can now turn her attentions to the two growing owlets and get some peace :). gillycat, i think you're right. and i bet her inability to remove the egg was causing her some real stress. good call, tracy and allen!